This morning, Ema, Eva and I met with Dr. Brisson and her cardiac surgery team at the University of Guelph small animal clinic. Dr. Brisson just returned to work this morning, but she had already been caught up to speed on Ema’s condition and prognosis by Dr. O’Grady and the other members of the Balloon Procedure team. When we arrived, Dr. Brisson was already aware of all of Ema’s various conditions, and she was ready to jump right in to doing her own evaluation. Two hours later, we got the news we’d been waiting for – Ema has a surgical date for tomorrow morning at 8:00 am. We are proceeding with her surgery, although we’re aware that there’s only a 50:50 chance that she’ll survive it. For Ema, this is her only hope. In the short time she’s been with us, all of us who love Ema have watched her condition slowly worsen. Even when being carried almost everywhere by Eva, Ema’s seizures are worsening, and happening more often. She’s tired and lethargic most of the time, and minimal exercise and excitement wear her out. Without surgery, she will suffer increasingly from the effects of her conditions, and I just won’t let that happen to her. As of this morning’s appointment, we’ve spent over $1700 just getting Ema to this stage. Her new surgical estimate is $4500.00, and we have about $2500.00 left of the money we’ve raised to put towards that. This means that, once again and for the final time, I’m asking for your help in getting Ema to the finish line. Tomorrow’s surgery will hopefully mean that Ema will wake up with a new lease on life, and a chance at finally being the puppy she so desperately wants to be. If you can help, please make a donation towards Ema’s surgery fund. With any luck, this is the last time I’ll have to ask, because tomorrow afternoon I’ll be telling everyone that she’s in recovery and doing just fine. The same offer applies that I made for CJ – if you donate $250 or more to Ema’s surgery fund, I’ll add a banner for your company (or whatever you want, so long as it’s legal) to this blog for six months. I know it must seem odd that I’ve waited this long to do a video of Ema. To be honest, a lot of it was cowardice – I spent a lot of time thinking “If she’s going to die any minute, I don’t know if I can take having a video of her out there”. But, here we are – almost two months later, and Ema is still hanging in there, gaining weight, eating ravenously and doing better than even her vets had expected her to. That deserves a video, don’t you think? This one is special, because from day one Sean has called her “Itty Bitty” (we were both pretty big “Pushing Daisies” fans). Update: Ema now has a Facebook Group. Become a Friend of Ema, and get additional news and photo updates. Today, Ema was supposed to be undergoing the procedure that we hoped would save her life. Instead, she is sitting here on my feet, as I write this. Ema, it turns out, is even more complicated than we’d thought, and it all has to do with doors. Allow me to explain, as briefly as I can, and bearing in mind that I am a layperson, and not a veterinarian. This explanation comes to you courtesy of the very excellent University of Guelph Veterinary Cardiologists, Dr. Schuckman and Dr. O’Grady. Picture your heart as two separate rooms, divided by a wall. Each room has door leading into it. 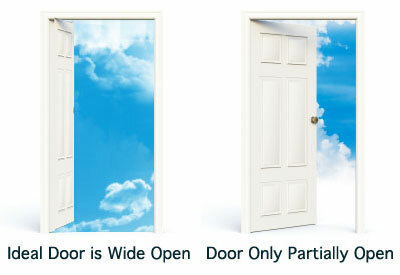 Ideally, this “door” should open fully, allowing blood to pass through it easily. Ema’s “door”, however, does not open fully. Luckily, our “rooms” don’t really need their doors – it’s perfectly fine for the doors to remain wide open all the time, or to be non existent. In the balloon procedure, a catheter would be inserted into Ema’s neck, and fed into her heart. There, the balloon would be inflated, essentially tearing her door off of its hinges, leaving her ‘room’ wide open, and allowing her blood flow to move normally through her heart. However, consider another option with doors. 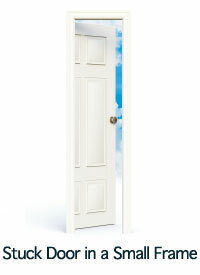 What if, in addition to the door being stuck, it’s also in a frame that’s too small – much, much too small? In this case, even removing the door isn’t enough, because the frame just isn’t large enough to allow sufficient flow of blood into Ema’s room. This is, in essence, Ema’s issue. Removing her door ( doing the balloon procedure to correct the pulmonary stenosis) wouldn’t be enough to improve her heart’s functioning to any serious degree. However, there’s another procedure that should be able to help her – a surgical correction. The surgeon will, more or less, tear out Ema’s door frame, building her a wider one shored up with surgical mesh. Ema will then have a wider opening, and no stuck door. Unfortunately, Drs. Schuckman and O’Grady don’t perform this procedure – they’re the “Balloon Team”, as they informed me. A Cardiac surgeon is needed to perform this, and Guelph only has one at the moment, and she happens to be on holiday until November 8th. Even then, she apparently hasn’t done many of these procedures (do I even need to mention that it’s a rare and complicated surgery, done only by a handful of people in North America? That should go without saying, since this is Ema we’re talking about). So, there’s a chance that Dr. Bisson, Guelph’s Veterinary Cardiac Surgeon, might be more comfortable referring us to a Veterinarian who has more experience in performing this surgery. This will mean sending Ema to perhaps Purdue, Cornell or Ohio State. So, we sit and we wait. We wait for the Cardiac Surgeon to get back from holidays, then we wait for her to look at Ema’s file and decide if she can perform the surgery. Then, we either wait for a referral to another vet, at another University. Then we wait for a surgery date. In the meantime, Dr. O’Grady said quite succinctly that “Ema is on a crash course with death”. He was frankly surprised that she’s doing as well as she is, and has survived for as long as she has. He asked, tentatively, if we could possibly tape one of Ema’s seizures – he’s never actually seen one himself, and it would be a great teaching tool for students at the university. Ema had another one this morning, and while I’m all for increasing the pool of knowledge among Veterinarians, grabbing a video camera is not the first thing that comes to mind when your puppy falls to the floor, goes rigid and then screams in terror. Financially, we should be OK. This new procedure shouldn’t cost much more the balloon procedure does, but it carries with it both better success, and greater risk. 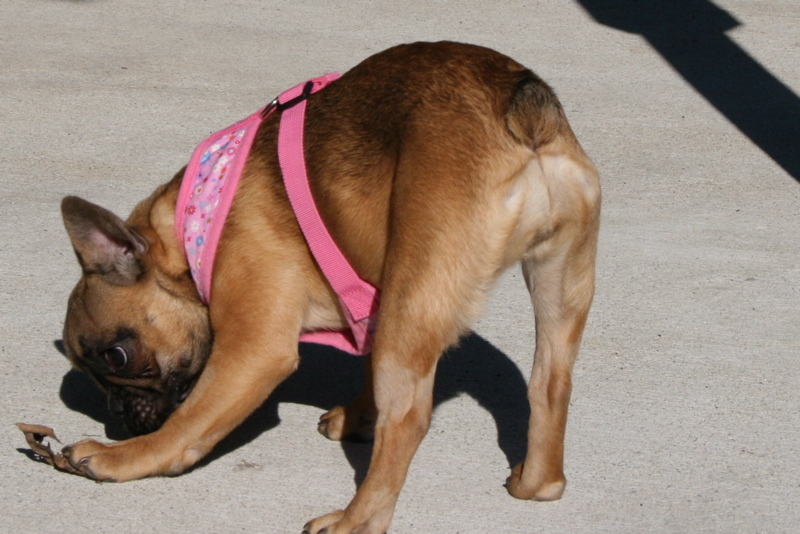 If Ema survives the surgery, her recovery success rate is as great as 95%. There is, however, a 50% chance that she won’t be able to survive the surgery. I’ll take those odds, because without the surgery there is a 100% certainty that Ema will die, and that it will be a slow, painful and terrifying death. I’m not thinking about that right now, however. I’m just watching the clock and waiting, and so is Ema. If you would like to read the actual veterinary report written by Dr. Schuckman, please click here to download the PDF. 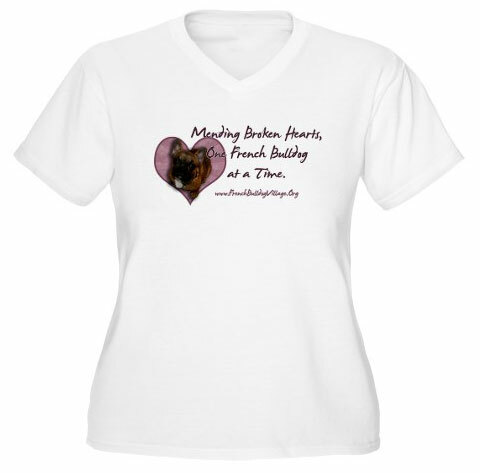 This new design for the French Bulldog Village’s Cafe Press store lets you show the world that Rescue is “Mending Broken Hearts, One French Bulldog at a Time”. Featuring the lovely Miss Itty Bitty (aka Ema), this design is available for light and dark clothing and accessories. Bumper sticker and button friendly designs are coming soon. See all of the designs at the FBV Store, or check out the sample t shirt below. 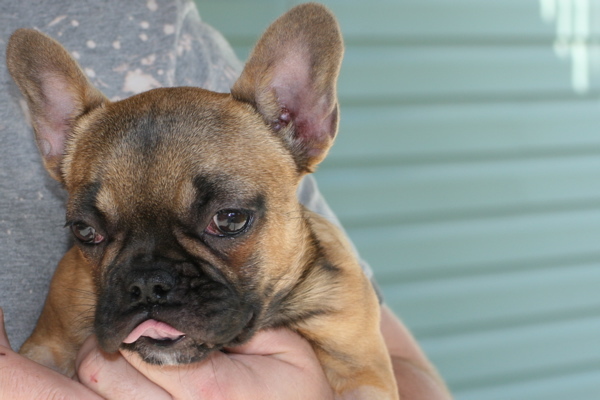 100% of all profits benefit French Bulldogs like Ema.